I’ve not been overly impressed with the few bottles from Kintra Whisky that I’ve tried (though an old Tomintoul I had one small sample of was rather nice). I hope this Clynelish 16 from a refill sherry cask will make it past the mid-80s. I rather came to like the last Clynelish from a sherry cask that I reviewed and that was from 1995 as well. This is one of only 90 bottles released by Kintra Whisky which suggests a cask split with another bottler. Nose: Uncoated tablet (just short of plasticky) and some minerally peat (sweet and pungent); bitter lime zest emerges after a bit along with salt crystals. The bitter notes subside a little with time but the lime is still very zesty. There’s some sweeter fruit lurking under there too (plum? green apple?). With water there’s a little bit of smoke. Palate: Starts out sweet and then the lime hits–less zesty on the palate. Nice, oily mouthfeel. Malty sweetness as I swallow and some salt. With time there’s some orange emerging alongside the lime. Water brightens the citrus up considerably (all lime now). Finish: Long. Sweet lime and some salt and then orange and a slightly milk chocolatey note. With water the brighter lime notes continue, turning a bit chalky at the end. Comments: Not terribly Clynelish and not obviously sherried but very nice indeed. Starts out austere on the nose but opens up slowly. And yes, this is my first scored Kintra that goes past the mid-80s. 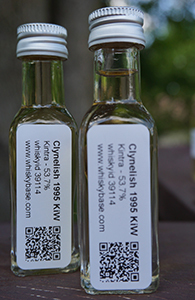 This entry was posted in -Whisky by Rating, 85-89 points, Clynelish, Kintra Whisky, Whisky by Bottler. Bookmark the permalink. Drinking a short pour of another 16 yo Clynelish from refill sherry casks (this one from G&M) and it’s quite similar though not finally as good: fruitier on the nose but also more generic on the whole.